Petraeus Did Not Consider Quitting Over Afghan Drawdown, Author Says : The Two-Way An Associated Press report about Paula Broadwell's new book led with the "news" that Petraeus "almost resigned." But that was wrong. Friends encouraged him to do that, she says, but Petraeus did not consider it. "Four-star general-turned-CIA director David Petraeus almost resigned as Afghanistan war commander over President Barack Obama's decision to quickly draw down surge forces, according to a new insider's look at Petraeus' 37-year Army career." "#Petraeus did NOT consider quitting, though mentors/friends encouraged it..."
The book — All In: The Education of General David Petraeus — is by Paula Broadwell from Harvard's Center for Public Leadership. Vernon Loeb, metro editor at The Washington Post worked with her on it. Gen. David Petraeus in Kandahar, Afghanistan, on July 4, 2011. "While conducting research over the past three years, Broadwell was afforded extensive access by General Petraeus, his mentors, his subordinates, and his longtime friends. Over the course of Petraeus's command of ISAF-Afghanistan from July 2010 through July 2011, Broadwell embedded with the general, his headquarters staff, and his soldiers on the front lines of fighting across Afghanistan." The AP, which says it was given an advance copy, writes that "Petraeus decided that resigning would be a 'selfish, grandstanding move with huge political ramifications' and that now was 'time to salute and carry on.' "
#Petraeus did not consider resigning over drawdown [because]: "such an act would be considered selfish...and afterall troops can't quit!" Aside from the first two sentences, the AP report has no further mention of Petraeus' thinking about the drawdown or whether he should resign. Petraeus was commander in Afghanistan from the summer of 2010 until the summer of 2011, when he became director of the Central Intelligence Agency. 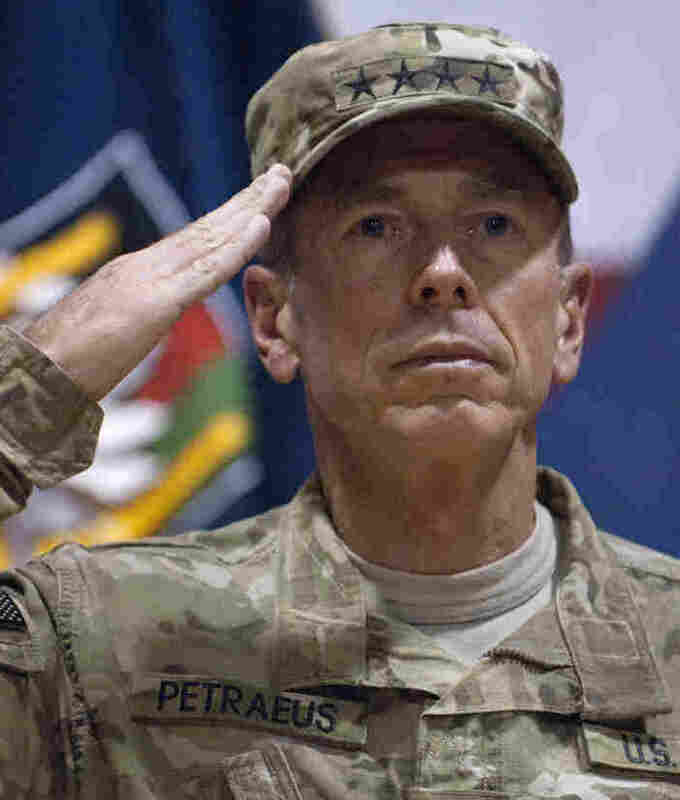 "Four-star general-turned-CIA director David Petraeus was urged to resign as Afghanistan war commander over President Barack Obama's decision to quickly draw down surge forces, according to a new insider's look at Petraeus' 37-year Army career. "Conservative writer Max Boot had urged he take that course of action, but Petraeus decided that resigning would be a 'selfish, grandstanding move with huge political ramifications' and that now was 'time to salute and carry on,' according to a forthcoming biography.
" 'Director Petraeus has publicly stated that he never contemplated resignation,' CIA spokeswoman Jennifer Youngblood said Thursday."